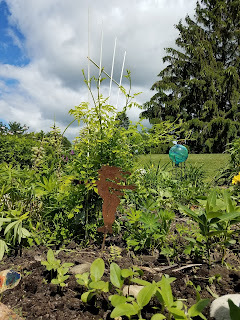 The trumpet vine tied to a trellis so it won't overtake lupine, milkweed, sunflowers. Photo by Susan Martell Huebner. First place poem this month is by a gardener, Susan Martell Huebner. I asked if she had a photo to illustrate the irritating trumpet vine about which she wrote. In response to my request, she sent the photo above. Acne on the polar ice caps of Mars. Saucers at a tea party for her dolls. This poem has been previously published in Slant, Vol. XXVIII, Summer 2014. By chance, the third place poem, by Tim Philippart, also reflects on irritation with something you might grow in your garden, though I suspect (if it is literally true) it was purchased at the grocery store. Not without satisfaction, I survey the carnage. lays in waste before me. has no rich red fruit to protect. All that remains is the seeds. spilling from my “seedless" watermelon. would be a little bit pregnant. to get away with these lies. with their black seeds of the choking kind. A seed full, truthful melon. that you can swallow if you’ve a mind to. These poets own copyright on their own poems. Thanks to Jenene Ravesloot who selected the winners of the June Poetry Challenge. Susan Martell Huebner’s literary fiction novel, She Thought the Door Was Locked, is available on Amazon. Her poems have appeared in anthologies, online and print journals as well as in postcard format. Susan lives in Mukwonago Wisconsin. Dennis Trujillo is a former US Army soldier and middle/high school math teacher from Pueblo, Colorado. In 2010 he spontaneously began writing poetry not knowing where the spark came from. Since then his poems have appeared in more than more than sixty print and online publications. His most recent work can be found in Anima Poetry Press, Highland Park Poetry, KYSO Flash, Origami Poems Project, and The Sacred Cow, among others. Tim Philippart loves to write. He sold his business in 2015, and since then has written several poems, some of which are scattered around his house, dropped like dirty socks. He writes, mainly, poetry and short pieces, sometimes with a hint of humor.